A local group of amateur astronomers held a stargazing session in a state park just outside Greensboro, North Carolina on the evening of April 2, 1994. Ten people were in attendance including four adults and six children. The children had shown impressive skills at detecting manmade satellites—some quite small and dim—travelling high across the local skies. At approximately 8:24pm EST, two of the children spotted a light in the distance and argued whether it was a satellite or an airplane. The light was relatively bright for a satellite. To settle the dispute, one of the adult astronomers swung around his 6-inch reflector telescope (6 inch diameter) and quickly found the object. Having previously seen satellites in the eyepiece, the astronomer immediately relayed to the children that it was indeed a satellite and not an airplane. The object displayed the characteristic yellowish glow of sunlight reflecting from its hull—the object being high enough above the earth to still catch rays from the sun which had set at 6:42pm local time. The image in the telescope eyepiece appeared as a moving star-like point of light against a dark, starry background. Even though the light was identifiable as a satellite, the telescope observer noticed an oddity—a small, green light apparently on the starboard side of the object along the edge of the yellow glow. The object was travelling west to east in typical satellite fashion at an apparent rate of speed comparable to a typical satellite in relatively low earth orbit. The amateur astronomer was baffled that his telescope could even pick up a tiny light on a craft several hundred miles distant. Also, he knew of no reason a manmade satellite would even be burning a power-draining bright light that could be seen that far away in a small telescope. Yet, this object was definitely reflecting rays from the sun and would have to be much higher than airplane altitudes to catch sun rays an hour and forty-two minutes after local sunset. The telescope observer wanted to confirm the object to be in space to totally dismiss the possibility of it being a high-flying aircraft of some sort. Right on cue, the light began to dim as it entered the earth’s shadow. This event confirmed the object to be high enough to definitely be operating well outside earth’s atmosphere. Before the group could lose sight of the object, the amateur astronomer returned to his telescope and immediately found the object. However, he was even more stunned by what he was now seeing. The yellow solar glow was gone, and the small, green light was gone (due to the decreasing angle of the craft as it drifted farther away from the observers). But now replacing the earlier view was an arrangement of four lights belonging to the apparently single object. The body of the object could not be seen due to limitations of the telescope and the dark background of the night sky. However, the lights were very distinct and as visible to the astronomer as an airplane in binoculars. The four lights appeared to be on the underside of the object. The overall image appeared to be approximately the same size as the Planet Jupiter when viewed through the telescope at the same magnification (approximately 42X). This fact would prove invaluable in determining the actual size of this apparently massive object. The amateur astronomer was now observing a triangle of white lights—two forward lights and a somewhat dimmer light at the rear. In the center, a steady-burning red light could be seen that seemed smaller than the three white lights. The object had remained fairly low to the horizon as it crossed the southern sky, and the missing green light had appeared to be on the far side of the craft; this would explain why it was eventually lost from view. Interestingly, the colors of the lights were similar in shade to the colors in typical aircraft lights. Now, the amateur astronomer was faced with a problem. This mystery object was large. All known manmade satellites are relatively small. The Space Shuttle was not aloft that week. And the astronomer knew that this could not be the only other sizable manmade object aloft in space—the Russian Mir Space Station. It was quickly becoming apparent that this object was a spacecraft of unknown origin. He watched the object until it became lost in the distance. Total observing time was close to three minutes. The first step in trying to analyze this sighting was to determine the object’s possible size from observational data. In the eyepiece, the formation of lights appeared to take up 30 to 50 arc seconds of sky (degrees being broken down by minutes and seconds of arc). Visually, the object had appeared to be in low earth orbit—judging by its apparent brightness and its rate of travel across the sky. The owner of the larger telescope agreed that the object—whatever it was—was definitely in low earth orbit. An arbitrary set of altitudes for the object was set between 100 miles and 350 miles above the earth. Its angle above the horizon was closely estimated to be approximately 25 degrees. With this data, an assumed altitude of 100 miles above the earth would make the object approximately 170 miles distant from the viewing site. A top altitude of 350 miles would make the object 640 miles distant. It was safe to assume that the object was somewhere within these parameters. Fortunately for the amateur astronomer, mathematics could save the day. 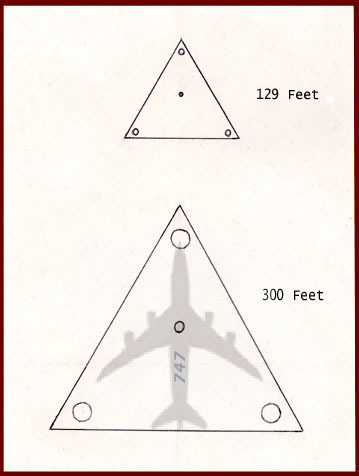 Seconds of arc could be converted into radian measure then multiplied by distance to yield a possible size for the craft. If the object was only 30 seconds of arc in the telescope eyepiece, with a minimum altitude of 100 miles and distance of 170 miles, then the size of the object would be approximately 129 feet to 487 feet across. If the object was as much as 50 seconds of arc in the telescope, and at an altitude of 350 miles and distance of 640 miles, then the size of the object would have to be approximately 215 feet to 811 feet. The stargazing group had witnessed a spacecraft of unknown origin in space measuring somewhere between 129 feet and 811 feet across. Whatever it was, it was large. The amateur astronomer decided to make a best guess at the actual size of the craft by arbitrarily choosing 40 seconds of arc as the image size in the telescope and 150 miles altitude. He came up with an approximate size of 294 feet across. This would give the craft a size that would happen to agree with other sightings of this type object. 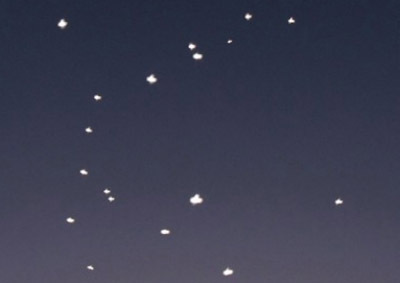 The amateur stargazer filed a report with the Mutual UFO Network in North Carolina and continued to wonder for a long time what he had seen that night. Five years later, in 1999, the amateur astronomer noticed a video of the exact same type object in a TV documentary. The March 1990 video, shot in Brussels, Belgium, showed the same arrangement of lights travelling just above the city where a local shopkeeper, Marcel Alfarano, had time to grab his video camera and shoot. The TV documentary went on to show that between 1989 and 1993 a major wave of sightings was documented by authorities mainly in Belgium which included one good photo that showed the actual shape of one of these objects with the same lighting configuration. The following is a summary of what the amateur astronomer in North Carolina learned relating to his 1994 telescopic sighting of one of these objects actually travelling in space.